This is a review of Deva Nutrition Vegan Hair-Nails-Skin Support. The supplement is meant to provide the essential nutrients to cells that are responsible for the growth of healthy hair, skin, and nails. It claims to have a unique formula and can be consumed by a person as a daily multi-vitamin. Keep reading to see if this product is meant for you. 500 mcg Biotin to promote healthy and strong hair. Other ingredients include: cellulose, vegetable stearic acid, croscarmellose, sodium, vegetable magnesium stearate, dicalcium phospahate, silicon dioxide. The manufacturer specifically states this supplement contains no animal sources and is completely vegetarian/vegan certified. Recommended dosage for this product is 1 to 2 tablets daily, preferably with a meal or food of some sort. Your dosage can vary if you are taking this supplement as directed by a doctor. As with all supplements, you do have the chance of getting a slightly upset stomach due to the amount of vitamins and minerals in it. This is why this supplement is suggested to be taken with food. Pregnant and nursing women should consult their doctor first before trying this product. Anyone who is experiencing adverse reactions should immediately stop the use of this product and contact their doctor. The price of this item varies since it is not sold directly from the manufacturer’s website. However the price range is between $9.00 to $13.00. On these authorized online seller’s website, the reviews for this supplement are generally positive, which means that a majority of those who have purchased this item have had success with it. There is no clear, distinct information about a money back guarantee on the manufacturer website. This means a potential consumer must rely on the return and exchange policy of the authorize seller. There is the ability for the consumer to contact the manufacturer directly with any concerns or questions about the supplement. 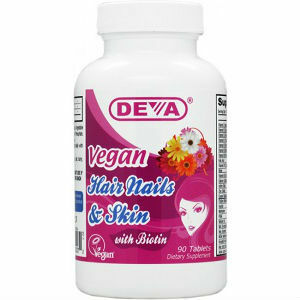 Deva Nutrition Vegan Hair-Nails-Skin Support is an affordable dietary supplement that will be able to replace your daily multi-vitamin due to its extensive list of ingredients. The fact that this supplement is also certified as vegan is another ideal option for those who are interested in looking for a meat free supplement. Additionally, the fact this supplement has gotten very positive reviews generally displays it will give results of strengthened hair, skin, and nails. Perhaps some of the downsides for the product is its lack of being able to directly buy from the manufacturer site and also the fact that there is no money back guarantee. If you are looking for an affordable, vegan-friendly replacement for your multi-vitamin this may be ideal for you. John Brownstone	reviewed Deva Nutrition Vegan Hair-Nails-Skin Support	on July 28th	 and gave it a rating of 3.